We've been very busy the past couple of months leading up to The Great Frederick Fair. We hope you had the opportunity to stop by and visit us and talk with us about our packgoats. If so, THANK YOU! If you are interested in packgoats or the 4-H Packgoat Project, please drop us a line at 4hpackgoats@gmail.com. We'd love to hear from. And in the meantime, check out our website, explore the photos of some of our past adventures ... and check back soon! After the fair we'll post results from the competition and share some more photos. And of course, we'll also get back to doing some hiking. Let us know if you'd like to join us! Oberhasli Goat Club Essay Contest Winners!! Congratulations to Lyndsey and Caven, Oberhasli Goat Club essay contest winners! Each have received gift certificates to Northwest Packgoats Supplies. Originally planned for some water work along the Moncacy River, high water and some closed trails forced us to change plans ... but still a great day for a hike, beautiful weather, and an opportunity to practice highlining skills. This was the first time we took the goats to Cat Rock. It's been a while since I hiked this trail ... it's actually a really nice hike. It's an in and out, only a little over 3 miles. But there is over 800 feet of elevation gain, so it's a nice climb. Steep enough to get good exercise but not so steep to be troublesome. And here is a link to a nifty little 360 degree panoramic a the top of Cat Rock ... you'll have to trust me and follow the link, I haven't been able to figure out how to embed it in Google Sites. This is nice little hike that has a few opportunities for the goats to get their feet wet. It's been a fairly dry spring so the water wasn't flowing as strong in years past, but the crossings are still fun and have enough water to require the goats to have the confidence to step into it. 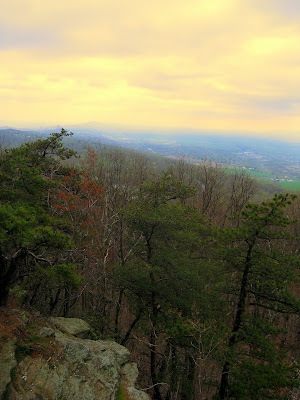 For our first hike of the season we visited Gambrill Park and hiked a combination of the Green and Black trails. This turned out to be a 3 mile hike by taking the Black trail on the west side of the park. This trail is a good way to begin the year as it isn't too tough, the trail is usually well maintained and it presents several good learning opportunities. Click on the EveryTrail link below and choose the option to view the map in Full Screen for a great slide-show overlay on the map with geo-referenced photos. As the winter begins to wind down it is time to start thinking about the 2012 Packgoat Project! We have some exciting activities coming up and some changes to our 2012 fair program that I think everyone will be really pleased about. Our annual information and signup night will be held March 11th this year, from 6:00pm to 8:00pm at The Common Market. For new and prospective members, this is your opportunity to learn all about the project. The primary focus is on training goats for trail readiness and learning outdoor skills for enjoyment of the backcountry. In addition we work on training the goats for an obstacle demonstration at The Great Frederick Fair. There will be a short presentation at the meeting to outline the project and answer any questions you may have. In addition, we will provide details of a Packgoat Essay contest being offered to eligible intermediate and junior 4-Hers. The grand prize for the essay will be a spring-born Oberhasli wether!! But of course you need not even own a goat to participate in the project. Many 4-Hers have participated using the lease program to utilize a goat owned by another member for as little as $1.